Louis Armstrong and Fletcher Henderson had laid out the blueprint for big band swing music in 1925, but it wasn’t until a decade later that mainstream audiences finally, wholeheartedly latched onto the sound. 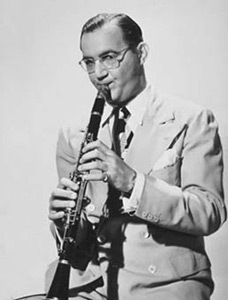 Benny Goodman’s “King Porter Stomp” was the record that broke through and started the national craze in earnest, but as the following selections show, it was far from the only important swing record released that year. 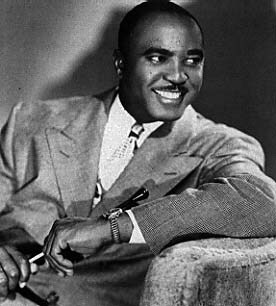 Like Milton Brown’s “Down By The O-H-I-O,” the playful lyrics in Jimmie Lunceford’s “Rhythm Is Our Business” call out the individual instruments before their solos, running through drums (“Oh, when he does tricks with sticks / The boys in the band all play hot licks!”), saxophone, bass and trumpet. The playing is superb all around. Joe Thomas’s tenor saxophone solo is particularly enjoyable, displaying an amazingly fluid sense of swing that leaves you wanting more. Brothers Tommy (trombone) and Jimmy (alto sax and clarinet) Dorsey were both talented musicians who would go on to become top bandleaders of the swing era. Early in their careers, before a falling out caused them to split, they lead an orchestra together and turned out some great music such as “Lullaby of Broadway” written by Harry Warren and Al Dubin, for the film Gold Diggers of 1935. The Dorsey Brothers’ recording featured Bing Crosby’s younger brother Bob (who would also go on to become a popular bandleader) on vocals. Crosby gives a fine vocal performance reminiscent of his brother’s warm crooning. The real treat here, though, is the incredibly tight playing of the band, which moves fluidly between a variety of styles from slow lullaby to buoyant swing. The use of a car horn as an instrument in the beginning is a great touch and sets a playful tone that carries throughout the record. The highlight comes in the final minute when the singing ends and the band really cuts loose with a wailing burst from Jimmy, some well-placed piano and percussion, and a fast-paced run at the end by the entire ensemble. Teddy Wilson’s sublime skill at the piano provided him with the opportunity to lead his own band in 1935, and right out of the gate that band produced this incredible record. With Benny Goodman on clarinet (who delivers an awe-inspiring opening solo), Ben Webster on tenor sax, Roy Eldridge on trumpet and Wilson himself on piano, it was already an all-star band, but what pushes this performance over the top is the addition of Billie Holiday on vocals. Holiday sounds like a veteran already, displaying an impeccable sense of swing as she plays her breathy voice like a jazz instrument. Holiday makes the lyrics her own, imbuing them with a sultry passion that speaks volumes beyond the words themselves. The way she sings “Oo-oo-oo, what a little moonlight can do-oo-oo” sends tingles up my spine. Some find the scratchiness of her voice distracting at first, but bear with it. If you are unfamiliar with the great Lady Day, you are in for a treat: the more you listen to her, the more you will begin to understand the subtle control and warm timbre that place her talent out of reach of mere mortals. In fact, Goodman deserves a lot of credit. Not only was he one of the best clarinetists and bandleaders of the era, but he was smart enough and colorblind enough to collaborate with the best musicians he could, even when that meant flying in the face of segregation. It was that kind of thinking that put Goodman into position to become the “King of Swing” in the first place. When Fletcher Henderson’s orchestra began to struggle during the Great Depression, Goodman wisely bought song arrangements from him and hired Henderson and his men to teach Goodman’s own musicians how to play “hot” swing music. And so it was that in 1935 Goodman’s band recorded a Henderson arrangement of Jelly Roll Morton’s tribute to fellow pianist Porter King. Henderson’s arrangement completely re-worked Morton’s original, transforming it from a solo piano / small group piece into one of the most amazing big band numbers ever created. And in 1935, Goodman’s group nailed the performance. This music is not derivative in any way. The band is incredibly talented and manages to swing with a graceful style all its own. Two performances stand out in particular: first, Goodman himself solos for nearly three quarters of a minute, laying down one of the most instinctive and inviting clarinet solos ever. Then, just as the listener has been completely entranced, trumpeter Bunny Berigan bursts in to take over with a solo as propulsive as Goodman’s was seductive. Berigan also provides the cool spark that kicks off the record, while Jack Lacey adds a fine, raspy solo on trombone. Great fun and deserving of its place in history! This was the first recording of “In A Sentimental Mood,” one of Ellington’s loveliest compositions. It is a moody loveliness, spending much of the time in a brooding minor key, but it also has a delicate beauty that is indeed sentimental. Harry Carney does a wonderful job on tenor sax, filling the first half of the record with a rich, warm, comforting tone. Lawrence Brown’s longing performance on trombone is nearly as good in the second half, and Otto “Toby” Hardwick (alto sax) and Rex Stewart (cornet) add all the right touches to bring it all together.